What, you thought the story had ended? That my last post wrapped up nicely with Grayson asleep for the night, waking up all better and ready to get on with his life? ha! No sooner had I pushed “Publish” on my post last night (seriously, within seconds), the screaming started. I sent Ryan into the nursery and was urgently called in. Grayson was burning up, and inconsolable. Took his temp- 103.4. We called the nurses line, and she had me count his breathing. 48 respiration per minute- over 30 and they recommend the Emergency Room. So off we went, forgetting the diaper bag. This was our eighth ER visit in 16 months. Seriously, where is our Frequent Flyer punchcard? We should be due a free visit by now. Buy 8 get one free? RSV- nope. Flu- nope. Partially collapsed lung and really high heart rate- ding! ding! The lung thing is a fairly common side effect of being intubated for surgery, and apparently unless you have a sharp metal object piercing through your skull, the ER does not consider your medical condition a big deal. So four-ish hours later, home we went, with an antibiotic to hopefully prevent pneumonia from invading his poor little beat up lung. Oh and they checked his ears while we were there. No fluid. So we can check that off our list. And now with the mess we’re in now, do I really want to repeat the hearing test in 3 months under sedation? This morning- all better? Ha! Fever- still there. Crying- all morning long. Breathing- when I was able to hear it over all the crying, it sounded like an old static-y record player. Oh, and he threw in back to back projectile vomiting episodes for good measure. I guess so I had plenty of laundry to do- in case I got bored. Called our pediatrician. Yep, bring him in. Our regular pedi wasn’t on call so we saw another doctor in the practice. We liked her a lot. She thinks he does indeed have a touch of pneumonia. Grrreeeat. He’s also constipated. So we’re on poop-watch. If he hasn’t pooped by Monday at the latest, we need to be very concerned. We got another antibiotic, which OF COURSE was not available in a generic, so it cost $60 and Ryan’s third trip to the pharmacy in as many days. Grayson is MIS-ER-A-BLE. He’s either crying, or whimpering, or sleeping. Nothing else. His fever is 101 and he’s making me burn up holding him. He peed all over me the last time I took his temperature. Ryan laughed. I rolled my eyes and cleaned myself up. Grayson screamed. Right now he’s in his swing, asleep. I’m not moving him. Not sure if I want to bathe him tonight or not. Two years ago today, I found out I had a little miracle growing inside me. He is worth all of this and so, so much more. I just want him to feel better. Well, it’s over. It’s been a long, hard two days but we are making it. Whoever said being a mom is like wearing your heart on the outside of your body was right on. 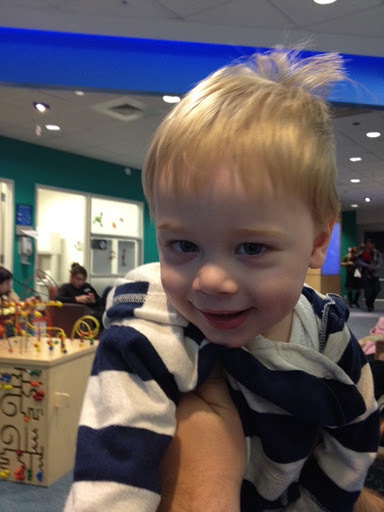 My little boy is so brave and is such a fighter, and he doesn’t deserve one second of the pain he is in right now. It’s heartbreaking. Yesterday, we got to the hospital at 8:30 and saw about 3 nurses right away to do pre-op paperwork and get Grayson’s vitals taken. I was thinking, great, we’re running ahead of schedule and we are going to get this thing over with. Ha! We were taken to a holding room, where we changed Grayson into this ridiculous outfit that was about 10 sizes too big, and waited. And waited, and waited some more. The nurses suggested we let G watch TV. Mmm, he has zero interest in TV (for the record, I am not opposed to him watching TV at all. If he did, it would sure make my life easier!). Then they suggested we let him play on the riding cars. Mmmm, he can’t sit up and letting him chew on the handles lasted about 45 seconds. So we did a lot of rocking, singing and making silly faces while we waited. For 2 1/2 hours. Bleh. And I was STARVING (and food was not allowed in the waiting room or holding area) and Grayson was starving, since he hadn’t had any food since 11 pm the night before. Turns out, the reason for the delay was there was equipment malfunction in our surgeon’s previous operation. 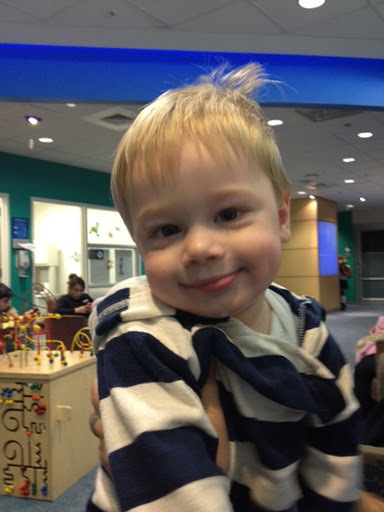 Finally, we met with the anesthesiologist and the surgeon, and they whisked G away. I left to get some food, and while I was gone, one of the doctors came out and let Ryan know the button was in and that part went perfectly. Then later the surgeon herself came out to let me know the biopsy was done, went fine, and the ABR (hearing test) was still going on. She had pictures of G’s stomach and the button, which was both creepy and cool. 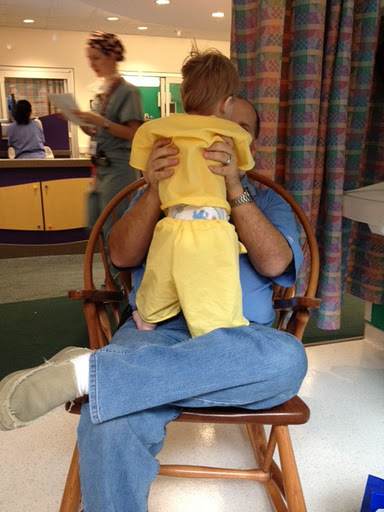 When the ABR was complete, the audiologist came out to talk to us. There’s good and bad news. 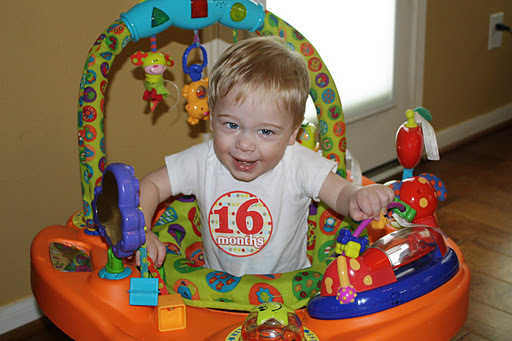 The good news is Grayson’s hearing is within normal range for high frequency sounds (hard sounds, consonants). The bad news is for the low frequency sounds, he has moderate to severe hearing loss. She wants us to check in our pediatrician to make sure there isn’t fluid on his ears and repeat the test in 3-6 months. This news really doesn’t surprise me, considering his speech delay and my observations of his reactions to sounds. Also, unfortunately, hearing impairment is yet another symptom of Mitochondrial disease. She said right now, Grayson isn’t a candidate for hearing aids because of the high-frequency normal hearing. Recovery. Grayson is not a fan of being told to wake up, especially out of anesthesia. He slept, and slept, and then slept some more. After a few hours of him snoozing away, we got kicked out of the regular recovery ward and were moved to a corner to wait some more. Thankfully, our corner of the PACU universe had rocking chairs and a TV, and we pulled out our cell phones even though it was against the rules. He finally (sort of) woke up and he was pissed. And hot. As in almost 104 degree fever hot. The last time he had a fever that high, he had a seizure. And like me, normally his temperature runs pretty low. So everyone was pretty concerned. The nurses gave him Tylenol and wiped him down with cool water, which did not help his attitude about the whole thing one bit. The sweet nurse told Ryan and I to go get something to eat, and when we came back, his fever had gone down to 100.3 and they said we could go home. Finally. Today has been rough. It is horrible to watch your child in pain and not be able to make it better. I’ve wanted so much to just hold him and comfort him, but he is far more comfortable in his swing than in my arms. Thankfully, his pain medication knocked him out almost all day. But when he wasn’t sleeping he was crying. He perked up around lunchtime, but then after sleeping on my chest for an hour, woke up with another fever. He cried and cried through his bath and has been sleeping in his crib since 6:30. Today was the PERFECT day for a nap. Pouring down rain outside, dark, and zero plans after a meeting (at our house) we had this morning. And I was sleepy. I had a major craving just to curl up on the couch with my Kindle, to read a few pages, and then quietly drift off to sleep. My child apparently did not share in my nap-craving. He woke up at 5:30 AM and slept a total of 45 minutes all day until we put him to bed 30 minutes ago- because little boys who don’t nap get to go to bed before the sun. And if you are thinking that he just wasn’t tired, well, you would be wrong. He spent all day rubbing his eyes quite dramatically, fussing, yawning, and laying his head on my shoulder. All because it was, indeed, a perfect napping day. So yeah, today was fun. We did go to HEB for a few minutes this afternoon to save my sanity. I bought a bunch of vegetables (as many as I could fit in the little handheld basket and still push the stroller at the same time) and came home and used my juicer for the first time. Yes, it was a wedding gift. Yes, we’ve been married three and a half years. Don’t judge. Carrot juice is actually really good. Refreshing. Grayson does not agree, but what does he know? He doesn’t like cheesecake either. So yes, those last 3 are hard to see on paper, but they are just numbers. The good great news is he is making progress, on his timeline. All his “teachers” were so excited to see the video of him scooting, although of course he wouldn’t do it for them in person. Tomorrow is his surgery. 11:00. I had a hard day about it yesterday- cried several times- but today I’ve been ok. I just HATE that they have to cut into his leg. His perfect, untouched, baby soft little leg. But, I’m glad he’ll be getting his button. Not much will change that I can see, but it will make bathtime a lot easier without a tempting tube hanging from his stomach to yank on. We have the button here at our house. The medical supply company mailed it to us and we have to take it to the hospital to be placed. I find this very bizarre. And I hope I remember to take it tomorrow. Turns out, we are going to do the hearing test tomorrow too. When I called the surgeon to tell her No, that Audiology said it was too long a test to be done completely under anesthesia, she said that sounded funny. So she called Audiology and Voila! we have a hearing test scheduled. As long as it’s safe, I’m thrilled with that. So we now have February 13 available if anybody wants to do lunch. 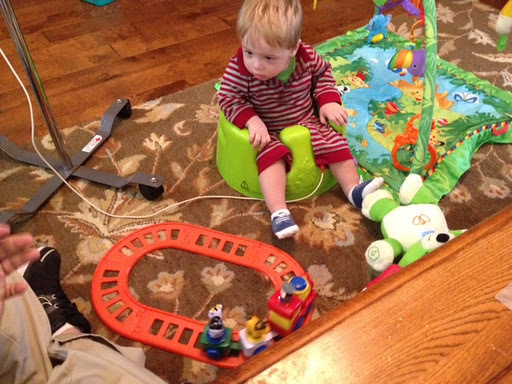 Ryan bought Grayson a little train set today as a Yay-for-being-brave-tomorrow present. It’s really cute. As you can see, in his sleep deprived state, he was about as thrilled with his new toy as he was the carrot juice. So if you have a minute tomorrow, say a little prayer for our little guy. Pray that he tolerates anesthesia, that the three procedures all go quickly and for pain management when he wakes up and when we go home. This is what I am most worried about. You are working hard on so many things. Everyone was so excited to see you scoot (and lots of people cried too!) and you are all about exploring your world with your hands. You grab everything in reach- my hair, the dogs, your tube (grrr) and love to put all of it in your mouth. 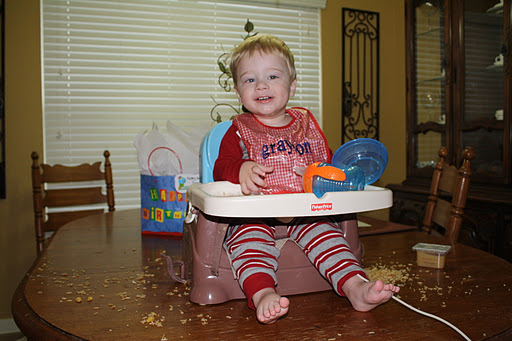 You much prefer dishes and bowls to actual food, and delight in making HUGE messes every mealtime. You are finally starting to really like books. Of course, your favorite thing to do is chew on the pages, but you will listen to me read and tilt your head back to watch my mouth move. Your favorite book is Calm Down, Boris! 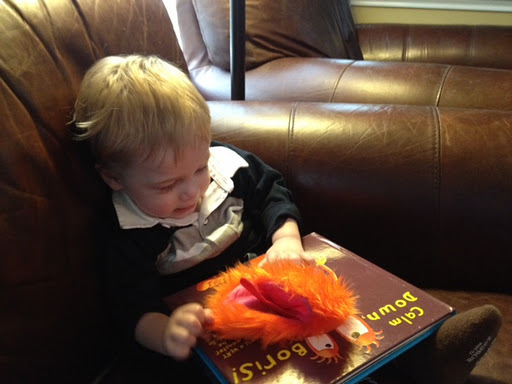 because of the silly monster puppet in the book that tickles your neck while we read. You also LOVE music- you will lie so still and quiet and just listen. You are definitely growing, big boy. With your second big-boy haircut and long and lean body (19 lbs, 3 oz, 30 inches) you’re trying to turn into a little boy without me noticing. 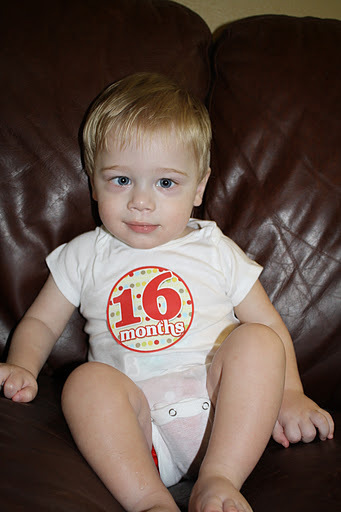 You are wearing mostly 12-18 month clothing and size 3 diapers. You are taking about 25 oz./day through your tube, but still aren’t eating much at all by mouth. Again, you would rather play with your food than eat it. Sigh. You are back to sleeping 12 hours at night and are still taking 2 naps during the day. I am so thankful you love your bed and almost always go down for the night and your naps without protest. What you are protesting, however, is the process of getting dressed and undressed. You hate it. And of course, because you hate putting clothes on and taking them off, your fight it, and it takes twice as long. Just sayin’. Another thing that is well, less than adorable, is your biting habit. No shoulder is safe from your razor sharp teeth, and when you do it, it HURTS. Please stop, k? We have a big month ahead. This Thursday, you’ll be having surgery to get your feeding button and the surgeon is also going to take a little piece of muscle from your thigh. We’ll have to wait a few months for all the tests to come back, but we are hoping that tiny piece of muscle will give us lots of information and we can use that information to help you grow and develop to your best. Mommy is very sad that you have to go through this, and I’m really bummed you are going to have a scar on your leg (but Daddy says it will make you look tough, so we’re going with that). We were hoping to do your hearing test at the same time as your surgery, but the doctors don’t want you to be under anesthesia for that long. So your hearing test will be next month, right before Valentine’s Day. I promise this month isn’t going to be all hospitals and doctors. We are going to have a lot of fun too. We love visiting all your friends, going to church, and of course swinging at the park. I want to make sure your days are full of smiles, fun and laughter. I love you GRB. Keep scootin’! I’ve been loving my new keep-the-house-clean routine. It’s amazing how doing a little each day makes such a huge difference. Although admittedly I’m spending a lot more time cleaning, I am so much more relaxed and am enjoying being at home so much more. I’m really hoping if I keep this up, it will become a habit and I won’t consider myself such a terrible housekeeper anymore. I’ve been slowly cleaning out/decluttering specific areas in the house. So far I’ve done the pantry, laundry room, and medicine drawer. And yesterday, I cleaned out the cabinet where I kept all the baby bottles. All those bottles, and millions of little parts that go to the Dr. Brown’s brand, were sorted, bagged and put into storage (well, storage being the corner of the spare bedroom until I can really figure out a good place to put them). And doing that made me cry. Being done with bottles was supposed to be a thing. A thing like potty training, or moving to a big-kid bed. A transition. Grayson and I didn’t get that transition. His bottle feeding days ended suddenly and dramatically. There was no transition, no weaning. And I realized his last bottle wasn’t given to him by me. I should have been able to give him his last bottle snuggled up in the rocking chair in his nursery. But instead, it was given by my friend, who was babysitting, and was vomited up violently before we took him to the ER. And it is kind of funny that I’m so sad about those bottles, because having to bottle feed was such a source of pain and raw emotion such a very short time ago. I know there will be other things like this, things that won’t get to be things. 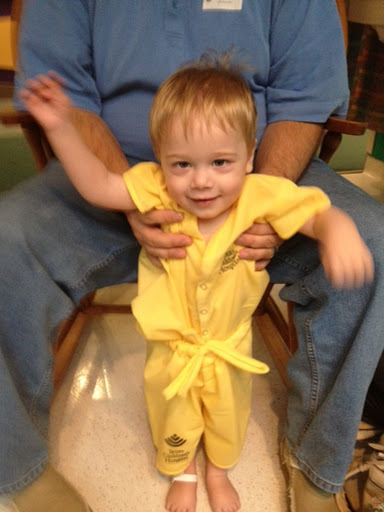 One day he’ll abruptly refuse to wear smocked outfits, or won’t fit in footie pajamas anymore. He might even decide that bedtime should be after the sun goes down and not before. One day he won’t be a baby anymore. Today we had a really, really good day. There was a period of about 30 minutes where we lay on the floor and giggled. Giggled our heads off, both of us. No toys, no phone, no cameras. I wanted to capture the moment on camera, to record that infectious laugh, but I resisted the urge. Somehow I knew the magic of that moment would be broken if I tried to bottle it up electronically. Moments like these are my things. So the good news is I now have a free cabinet. Well, a cabinet that is now full of sippy cups. I wonder when I’ll form an attachment to those? Grayson started scooting a little right before his surgery, but we stopped working on it for a few weeks to let the G-tube site heal. Last night he showed off his new skills for his daddy and me, and today I caught it on video. 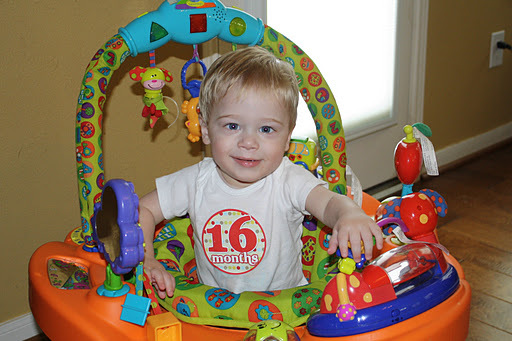 We are celebrating every little inch with our amazing little guy! Yesterday morning our family made our way downtown (and got trapped downtown for awhile due to 95% of the streets being blocked off for the marathon) for the United Mitochondrial Disease Foundation support group. Grayson has not been diagnosed with Mito at this time, although we strongly suspect this is what he has. We are hoping if he does have Mito, the muscle biopsy he’s having in a few weeks will show it. I’d never been to a support group before, and wasn’t sure what to expect. I was impressed that there was something for everyone- a nursery for the babies and toddlers, a kids/siblings group, parents of kids with Mito group, and adults with Mito group. Ryan and I of course went to the parents group. The most interesting (and beneficial) thing for me was to see kids older than Grayson living with Mito. Mito is a disease that has a WIDE spectrum of symptoms and some are more severely affected than others- there were kids who could walk and kids who couldn’t, kids on oxygen, kids with braces on their legs, kids with feeding tubes. There were kids with normal cognitive abilities and some without. All the kids looked happy though, and were obviously loved and adored by their parents. I have a really hard time picturing Grayson at older ages, and it was nice to see that even kids with significant challenges are HAPPY and can have a great time on a Saturday morning. The parents group was great- I felt on the verge of tears the entire time, both happy and sad. Sad because these families are dealing with so much, and happy because wow, it was amazing to be in a room filled with families that really get it, who really understand what we are dealing with. At one point the facilitator looked right at me and commented that I had a panicked look on my face- ha! I’ve never been good about hiding my emotions, and yes, a lot of this does make me a little panicky. I really hope we can further connect with these families- I realized I am craving information and a connection from people who are further along in this journey than we are. Next month, the UMDF is having an Energy for Life walk. My friend Kristi, whose daughter is also suspected to have Mito, is putting together a team. Grayson and I will be walking and if anyone would like to join us on the Lady A Team, click here. There is also a link on the page to make an online donation. We are excited to meet even more people and to help raise money to hopefully one day cure this disease!